Across the U.S. and Maryland, solar power is booming as a source of energy, benefiting consumers, communities, and our climate. Solar energy not only reduces our carbon footprint and decreases air pollution, but it is quickly overtaking fossil fuels as the leading job creator in the energy sector. The number of solar jobs in the U.S. has reached over 260,000! The solar industry has helped create one out of every 50 new U.S. jobs added in 2016. In fact, there are more people working in solar now than at oil rigs and in gas fields. In Maryland, over 5,300 people are employed by the solar industry. We expect that number to increase with the momentum of our community solar campaign. If you live in the Pepco region in Maryland, sign up for community solar today! (For all other regions, see sign-up information below). Sign up here to get updates on community solar projects in your neighborhood! Maryland’s community solar pilot program allows families to take advantage of the cost savings of solar without having to own their home or install equipment on their property. Community solar allows customers that rent, have shady roofs, or are otherwise unable to install solar on their residences or commercial buildings to buy or subscribe to a portion of a shared solar system. The subscriber’s share of the electricity generated by the project is credited to their electricity bill, just as if the solar system were located at the home or business. Solar projects may vary from community to community, depending on the solar developer, the utility company that serves the region, and the customer’s requirements. Regardless, all the projects will be designed so that solar subscribers will see lower rates. This is welcome news in the wake of the disastrous Exelon-Pepco merger. Mere weeks after getting final approval for its merger, the energy behemoth Exelon-Pepco filed for massive rate hikes in Maryland. Maryland’s three-year community solar pilot program has started! The community solar operators, known as subscriber organizations, are currently enrolling customers. Maryland is hoping to install 200 megawatts of solar energy through this plan. Sign up to let us know you’re interested in community solar, and we’ll let you know about projects as they come online in your utility territory. Anyone! Anyone who has an account with a utility in Maryland (except SMECO) and meets the individual requirements can join. Importantly, the pilot program was designed to provide low- and moderate-income households an opportunity to participate in community solar. This commitment to making solar accessible to everyone is critical because, even as solar electricity takes off, working families account for only a small fraction of all residential solar installations. This inequity is stark in Maryland. 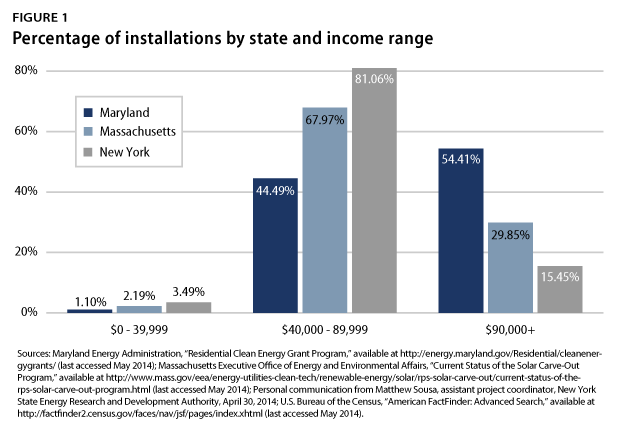 According to the Center for American Progress, only one percent of residential solar has been installed in Maryland communities where median household incomes are below $40,000. Maryland’s community solar program is a major step towards a more equitable clean energy economy. If you live anywhere other than the Southern Maryland Electric Cooperative (SMECO) service territory, you can sign up for community solar today! Neighborhood Sun and CleanChoice Energy are taking subscribers. Go to their websites to sign up and see what’s being offered in YOUR region. Click HERE to go to Neighborhood Sun’s general sign-up page. Click HERE to go to CleanChoice Energy’s sign-up page. If you live in the Pepco region of Montgomery or Prince George’s Counties, you can sign up right now through Neighborhood Sun to have a $100 donation given to CCAN in your name. Click HERE to do so – CCAN (and the planet) will thank you! If you get your energy from Delmarva Power, you can sign up right now through Neighborhood Sun to get locally produced solar power AND have a $100 donation given to CCAN in your name. Sign up at www.neighborhoodsun.solar/ccan today! Neighborhood Sun and CleanChoice Energy are both offering projects in BGE territory. If you sign up with either of them in BGE, they will make a donation to the Climate Access Fund to expand access to solar power in low- and moderate-income communities. CleanChoice Energy: BGE customers can save up to 10% off their utility rate by joining a local Community Solar Farm. * No rooftop required and no money down. For all projects, you’ll use electricity exactly as you do now and BGE will continue to maintain the wires. And, there’s no new equipment or home visit needed. Low-income customers are eligible for exclusive benefits. There are a limited number of spots available, so sign up today for solar savings with no installation or maintenance. Have any questions or want to learn more about community solar in your neighborhood? Email Taylor Smith-Hams, CCAN’s Healthy Communities Campaign Organizer, at taylor@chesapeakeclimate.org. Interested in participating in a community solar project in your neighborhood? Let us know here! Click HERE for Neighborhood Sun’s frequently asked questions and answers. Click HERE to request further information from CleanChoice. Cost breakdown for BGE Territory options.